Flowers. Photo from Chris Garnons-Williams on 16 September 2013. The etymological root of the binomial name Amicia is named after Giovanni Battista Amici (1786 – 1863), an Italian astronomer. Zygomeris is derived from the Greek zugos meaning ‘yolk’ and meris meaning ‘part’. Erect and clump-forming Form. Pruning Group 14. 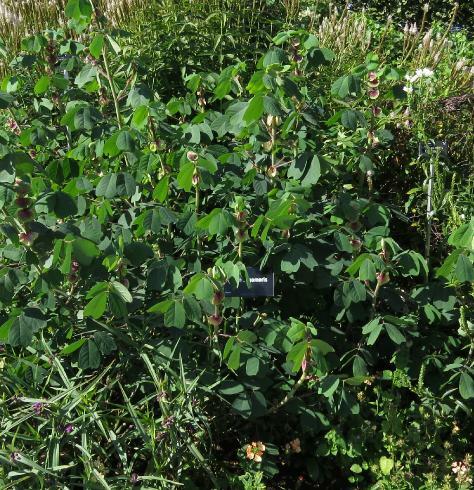 "Amicia are upright perennials with alternate leave composed of 4 leaflets, with conspicuous purple-veined stipules and pea-like flowers in autumn. 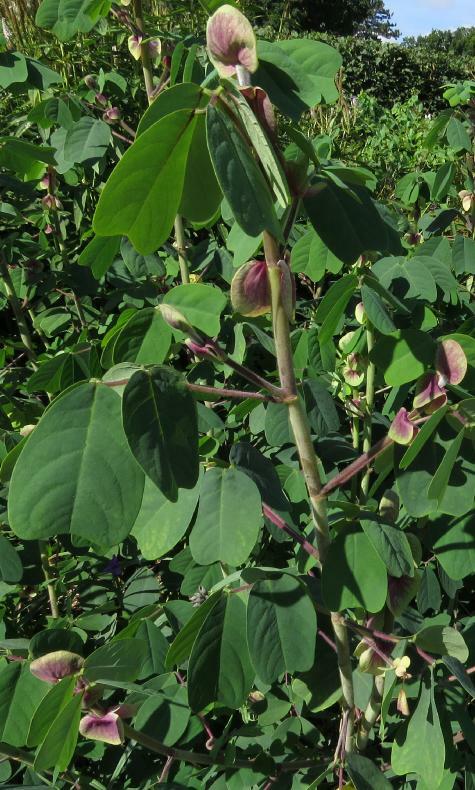 Amicia zygomeris is a woody-based perennial with leaves composed of 2 pairs of heart-shaped leaflets. 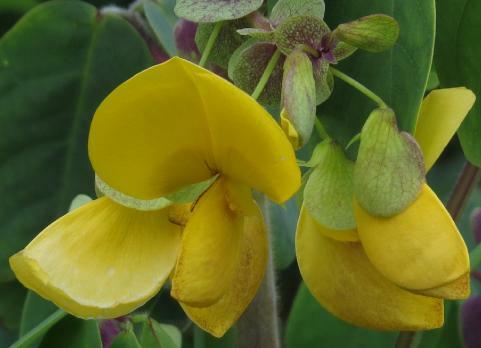 In autumn, pea-like purple and yellow flowers 3cm wide open in short racemes. 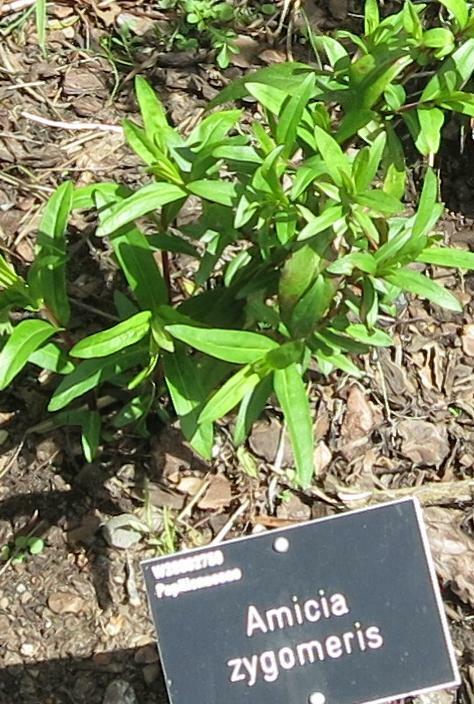 Outdoors grow in well drained fertile soil in full sun; mulch in winter in frost prone areas. 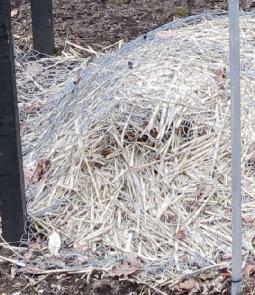 Will tolerate temperatures down to -10°C (14°F) and regenerate from the woody base if cut back by frost. Under glass grow in loam-based potting compost (JI No.2) in full light." from Royal Horticultural Society. 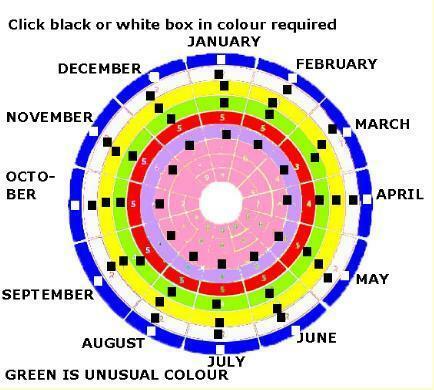 "When plantsman Sean Hogan shared this with me under the guise of it being hardy, I had to laugh. Although Amicia zygomeris is native to the mountains of Mexico, I never expected it to survive our winters. Despite a late planting in 2004 and a severe hit-and-run with a rabid wheelbarrow, up it came in spring like nothing had happened. 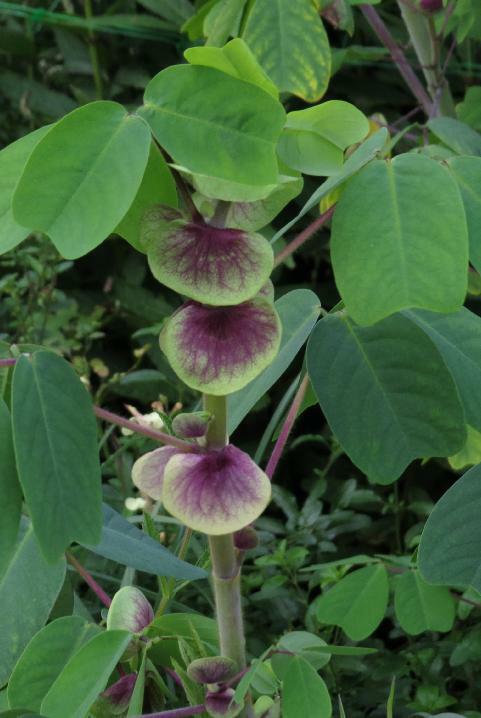 Amicia zygomeris is an alien-looking pea relative that makes a 7' tall, upright perennial with glaucous green foliage that folds up at night. Near the top of the fuzzy stems, the leaf axils are adorned with funny-looking, purple-stained stipules. 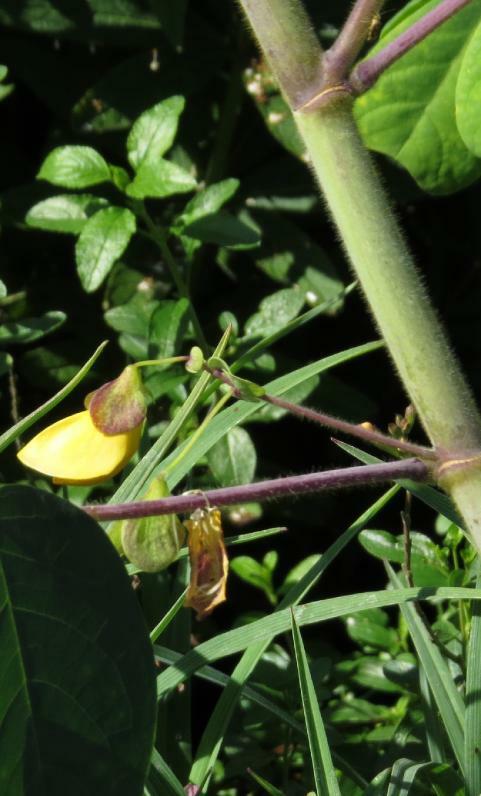 The amicia stalks are also adorned with large, yellow, pea-like flowers throughout the summer and until frost." from Plant Delights Nursery. Do remember to inoculate your wheelbarrows in America against being rabid and self-moving in order to protect these poor defenceless plants!! "I did it exactly the way Christopher Lloyd suggests in his Exotic Planting for Adventurous Gardeners book and had a good success rate. I got a smallish plant fairly late last summer which I kept potted and took semi-ripe cuttings in late October. Because it's quite a soft-leaved plant you do need to be quick about taking the cuttings and potting them up otherwise they wilt really quickly. As it was only a small plant I had last year, I only managed to take 3 cuttings from it, but 2 of them rooted within 4-6 weeks, kept in a propagator to keep the leaves turgid. This year the plant I put out has got quite big (would probably be 6 feet tall if it hadn't flopped so much in all the wind and rain) and I hope to take more cuttings, again in late October when the stems are a bit riper." 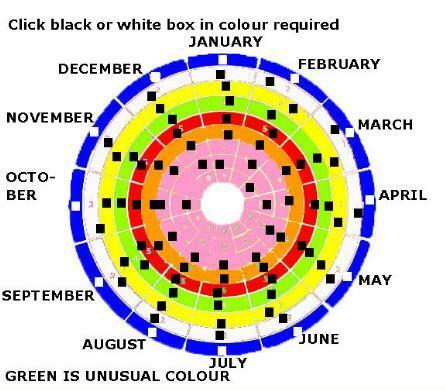 from Hardy Tropicals UK. "Right at the bottom of the Glasshouse Bay adjoining the Tropical Rainforests display is the unstoppable Amicia zygomeris." 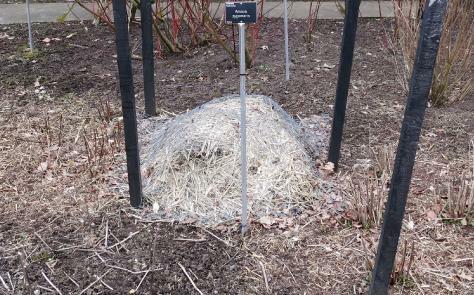 in the Cambridge University Botanic Garden. Available from Shoot and Cotswold Garden Flowers in the UK with Plant Delights Nursery in America. Autumn Foliage. Photo from Chris Garnons-Williams on 16 September 2013. Winter Form from Mixed Borders at RHS Wisley. Photo from Chris Garnons-Williams on 4 March 2013. Spring Form from RHS Wisley. Photo from Chris Garnons-Williams on 15 May 2013. Flower Bud from Mixed Borders at RHS Wisley. Photo from Chris Garnons-Williams on 16 September 2013. Juvenile Flower from Mixed Borders at RHS Wisley.